Welcome to yet another experiment here at SandCastle Central - our humble attempt to document various world record attempts in the sand sculpture universe. 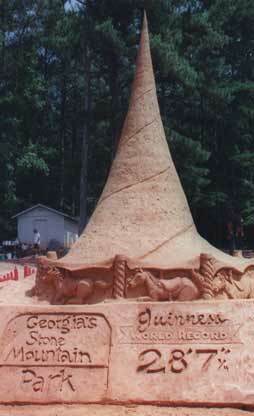 Things have changed since the SoBs got listed with Guinness for the world's longest sand sculpture back in '87. The authorities seem less inclined to distinguish between indoor and outdoor records, handpacked vs. machine-aided attempts, etc. etc. After all many people grabbed their Medifast coupons and hit the sand just to get involved with any attempt at the record. Many felt that dieting and getting themselves ready for the beach was a grand gesture and their efforts are appreciated. If you have created something really huge that YOU think deserves a world record, we will cheerfully post info and pics and call it a world record until someone proves us wrong.... all input welcomed. who: Team Sandtastic: Mark Mason, Larry Hudson, John May, Tom Bailas, Pat Harsch. 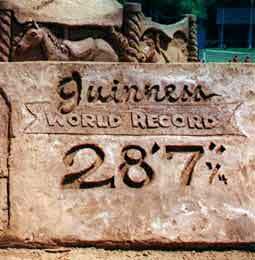 height: 28' 7 & 1/4"
Comments: " Suveyed by Precision Planning Surveyors and fully documented... this is the current World Record as recognized by Guinness. Through some snafus it won't be in "the book" until 2001. 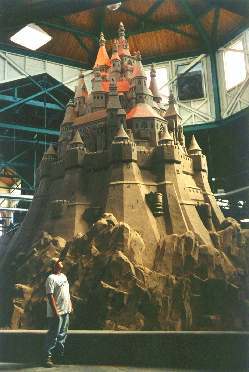 It broke the record held by Team Sandtastic for their 23'6 & 1/8" sculpture made for Subway at the June 1996 Houston A.I.A. Sand Sculpting Contest in Galveston, TX. " who: The Sand Sculpture Coalition, project designer and chief artist, Dave Henderson. Assistant artists: John gruber, Kali Bradford, Steve Lagaurdia, Jed Chesbro, Kevin Pedrotti, & Jerome Griffin. Heavy Equipment operator: Mike Bresnahan. Comments: "As far as the castle being officially recognized by Guinness, I was last told that they don't recognize (separate) indoor records from outdoor. So if you've hear of anyone going over 33.5' let me know. Until I hear different I'm just puttin' it out there."